I have been born and raised in the Catholic Church but it was not part of my identity until much later in life. I followed the rules often not knowing why but merely because that’s what you do – you follow the rules. As the mystery and genius of the Catholic faith has been revealed to me through circumstances I’ve faced or people I’ve shared my life with, my relationship with Jesus has become more than just disciplinarian and student but truly personal companionship. I am not a theologian or have an advanced degree in religion or writing but believe that my experience as a husband, father, son and brother may be relatable to you and lead you closer to Him. God fed the multitude with 5 loaves and 2 fish. What can He do with the gifts that YOU have? 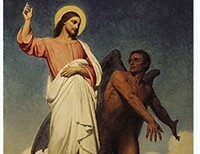 Jesus has just finished fending off Satan for 40 days in the desert. That’s 40 days without food. 40 days in the heat, with sand everywhere, without a shower. 40 days of saying “no” to sin and “yes” to God. Sounds like Lent, or what it’s meant to be!